The marketing team for Logan simply won't stop. We have only seen a single, albeit awesome, teaser trailer for Hugh Jackman's final Wolverine movie, but we are starting to lose track of the images that are being released. Not that anyone is complaining, because we just got a new look at a villain in Logan. The image was posted to the official Instagram account for Logan and features a metal hand draped over a car door. We also saw a similar looking metal hand in the teaser trailer that belonged to Boyd Holbrook, who is playing the villain Donald Pierce in the movie. 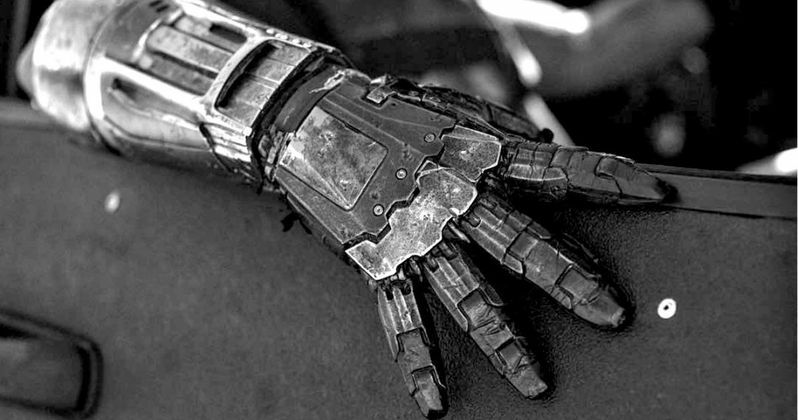 Our best guess is that this metal hand belongs to him, but it could also belong to one of the Reavers, a group of villains in the movie who are dedicated to destroying mutants and are part cyborg, so they will also likely have metal arms. In any case, it looks pretty cool. Logan is going to be the third solo Wolverine movie in Fox's X-Men franchise. The first, X: Men Origins: Wolverine was arguably the worst of any X-Men movie to date, but The Wolverine was a solid rebound. This installment will be bringing in a fairly significant mutant from the comics in the form of X-23, who is sort of the female version of Wolverine. She is being played by Dafne Keen and was recently featured on a new poster released by Fox. It is likely that the villain featured in this photo, be it a random Reaver or Donald Pierce, will probably coming after her and Logan. Hugh Jackman has had an unprecedented, amazing run as the character of Wolverine, aka Logan. He first played the part in Bryan Singer's X-Men back in 2000, which is largely responsible for the boom in superhero movies over the last decade and a half. He has since played Wolverine in seven movies, as well as a cameo in X-Men: First Class. The last solo outing featuring the character, The Wolverine, grossed a respectable $414 million worldwide, but given that Logan is going to be his last go as the character, it isn't hard to imagine this movie doing better at the box office. Never underestimate how much fans love Hugh Jackman. Logan stars Hugh Jackman, Boyd Holbrook (who may or may not be featured in this photo}, Dafne Keen, Stephen Merchant, Doris Morgado, Elizabeth Rodriguez, Richard E. Grant and Patrick Stewart, who is reprising his role as Professor X. James Mangold has returned to direct the movie after helming The Wolverine. The movie is set for release on March 3, 2017. Be sure to check out the new image from Logan for yourself below. Logan Is 2017's Most Complained About Movie in the U.K.